The left and media always claim that the dems never said they didn’t want to give Trump and the American people their wall. But we all know that is just utter David Hoggwash. This week Speaker Pelosi made it clear there will be no money for President Trump’s border wall in the legislation being working on to avoid another shutdown. So you can all stop with the “They never said that they wouldn’t fund Trump’s wall” crap. 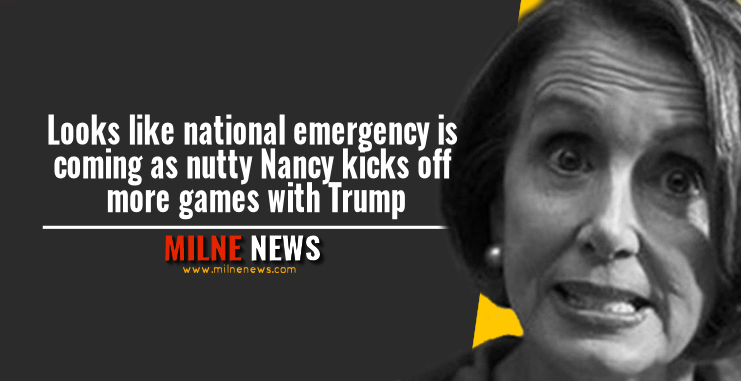 Instead, nutty Nancy said she would accept crappy ‘normandy fencing’ – crisscrossed posts, lined with barbed wire or mesh – as it already exists in places on the border. Ok she didn’t say crappy, but she might have well said that. ‘If the president wants to call it a wall he can call it a wall,’ she added. President Trump wasn’t going to take that lying down and fired back at her when he spoke to reporters at the White House. He then argued caravans of immigrants were in route from Central America to the U.S.-Mexico border and Pelosi would beg for a barrier. ‘Nancy Pelosi will be begging for a wall,’ he said. The president again vowed that if there’s no money for his wall, there’s no deal. And he said he’d make a decision on declaring a national emergency – thus getting money for his wall that way – after the February 15 deadline for the negotiators. ‘I’m waiting for February 15,’ he said. Vice President Mike Pence said the administration would ‘continue to fight’ for a wall. ‘What the president is calling on Congress to do today is an all of the above strategy. But, all of the above includes a wall. All of the above includes a physical barrier with high density areas law enforcement communities say it is most needed. We’re going to continue to fight for just that,’ he said at a DEA event on Thursday. You getting that Nancy? Wall or nothing.